Jeep strengthens the model line with an all-new compact SUV. Updated October 17, 2017, to include IIHS rating. An all-new Jeep with a very familiar face. The fast-growing Jeep product line has had the burden in recent years of carrying a pair of aging and underperforming models, namely the compact Patriot and Compass SUVs. Although sales for both have contributed significantly to the brand, neither model supplied the good ‘ole wholesome “Jeepness” found in other vehicles. That changed earlier this year when Jeep released the second-generation Compass, a now larger and more robust model with the looks and off-road credibility fans expect. Oddly, the first model year of the new Compass overlaps the final year of the old Compass and Patriot, with both Compass models still found side-by-side on some dealer lots. If you’re shopping for a new Compass, you’ll want the one offered in Sport ($20,995), Latitude ($24,295), Trailhawk ($28,595), and Limited ($28,995) editions. Add $1,500 for AWD on the Sport and Latitude and another $1,095 for your destination charge. Besides styling, one of the most important tell alls that you are looking at the new Compass is with the available transmissions. Specifically, a 6-speed manual replaced the previous 5-speed gearbox, while a 9-speed automatic replaced the continuously variable automatic transmission. Confused? That’s understandable. 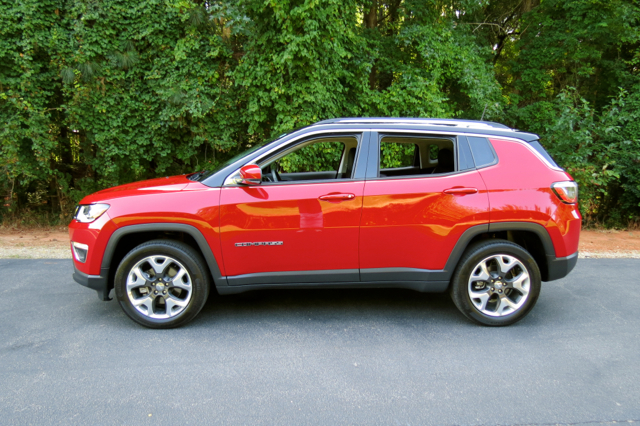 Why Jeep simply didn’t assign a 2018 model year designation to the new Compass is beyond me. At least Jeep, the EPA, and others are using the “New Compass” designation to identify the latest model. On personal inspection, that isn’t hard to do as the second-generation Compass has a slightly larger footprint and a modern design. 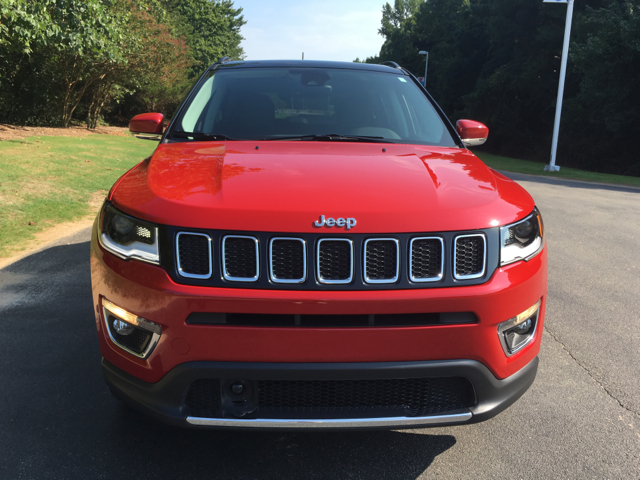 The seven-slat grille and updated LED lighting treatments bring a modern touch to the Compass. The silhouette is more fluid while a new interpretation of the wheel well arch theme is evident. Front to back, the new Compass aligns closer to the models on either side where it sits in the product line, namely, the even smaller Renegade and the slightly larger Cherokee. 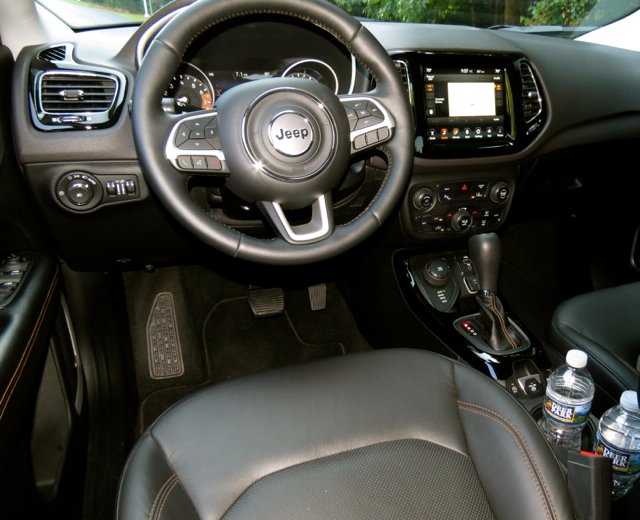 If you like the Jeep Renegade, you’ll enjoy the Compass’ interior. The Compass comes from the Renegade, riding on a longer and wider version of the platform underpinning Jeep’s smallest SUV. 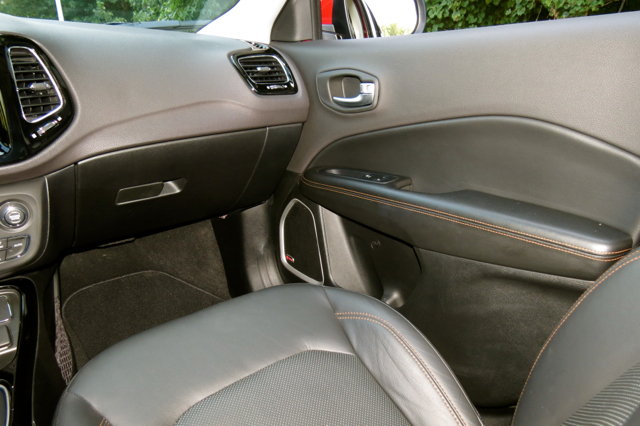 You’ll find plenty of soft touch materials, plastics, and brightwork trim in the new Compass. 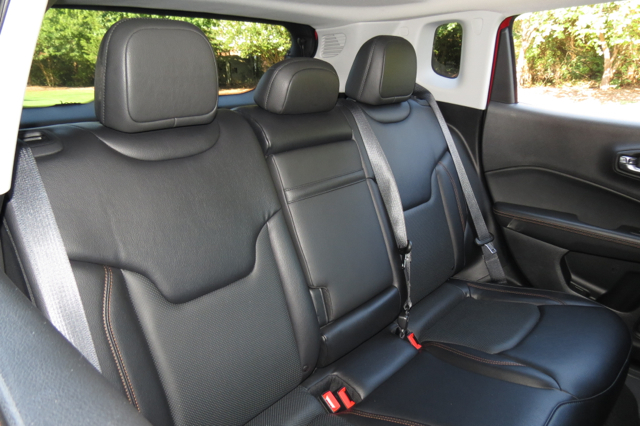 Cloth seats are standard, vinyl and leather are optional and, yes, you can fit five inside. All controls are neatly ordered and the infotainment screen sits high in the center stack. You’ll find a generous list of standard features with a longer list of upgrades, including various UConnect infotainment and navigation options, audio packages, and appearance items. 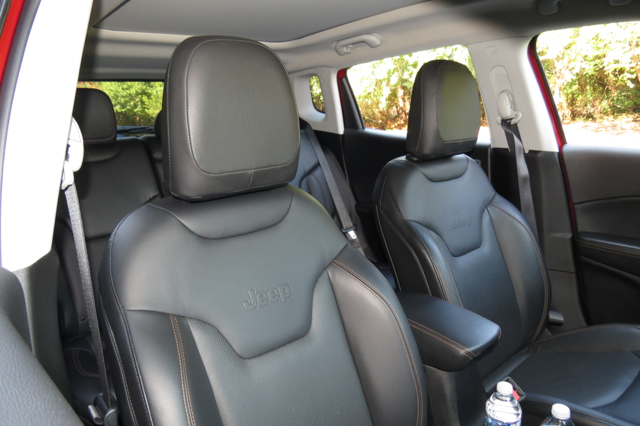 One thing about Jeep is that you start off with a number of grades or trims and then choose your upgrades accordingly. Four-Wheel Drive or All-Wheel Drive: Does it Matter? 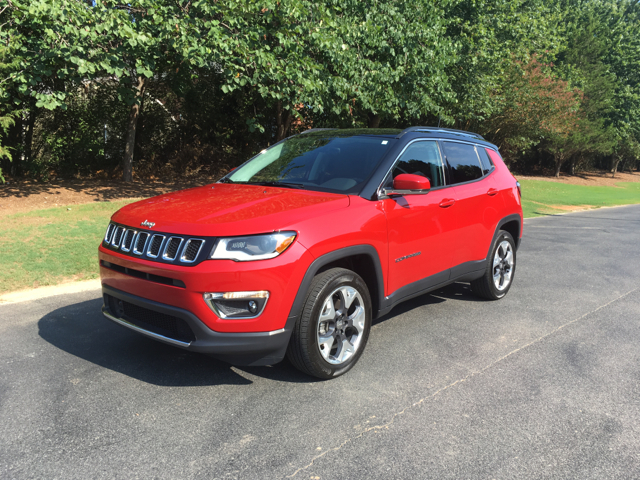 Jeep advertises the 2017 New Compass with standard front-wheel drive and available four-wheel drive. But there is a problem with the language used in the latter as the Compass has available all-wheel drive, not 4WD. Sure, the Jeep system mimics four-wheel drive, but that’s not enough. A true four-wheel drive system offers either part- or full-time 4WD with a two-speed transfer case present, for high and low gearing. Further, nearly all four-wheel drive vehicles offer standard rear-wheel drive with the system always biased to the rear wheels. Not so with the front-wheel drive-based Compass. Jeep does provide a “4WD lock” button that engages all four wheels under certain conditions, such as when operating in snow, sand, and mud. Further, my test Limited 4×4 model lacked true under-body protection, such as skid plates. That said, you shouldn’t be afraid to take your Compass off road provided you’re navigating well-worn trails and avoiding deep mud. Bouldering? Leave that work to the Wrangler. With 180 horsepower and 175 pound-feet of torque, the Compass’ lone engine is sufficient at best. Under the Hood: More Power…Please! The most recent Jeep Compass offered two four-cylinder engine choices, with the duo displacing at 2.0 and 2.4 liters, respectively. For the new Compass, Jeep ditched the smaller engine, but kept the larger one. Unfortunately, you have only one engine choice and for some shoppers, that’s not enough. The Compass’ engine is fair and that’s being kind. It takes you from point to point, but there isn’t any excitement along the way. A 10-percent boost in performance might help, but even then it might not be enough when this SUV shoulders a full contingent of people and their gear. Indeed, with a curb weight topping 3,600 pounds with the Trailhawk, that’s a lot for this naturally aspirated engine to handle. 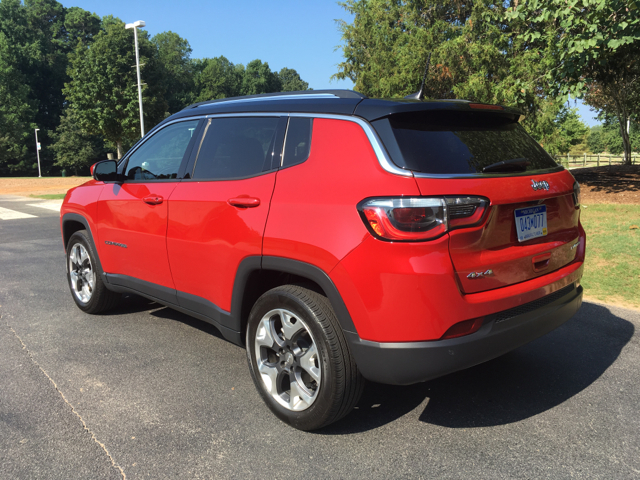 Snagging the 3.2-liter V6 powering the Cherokee would do the trick. 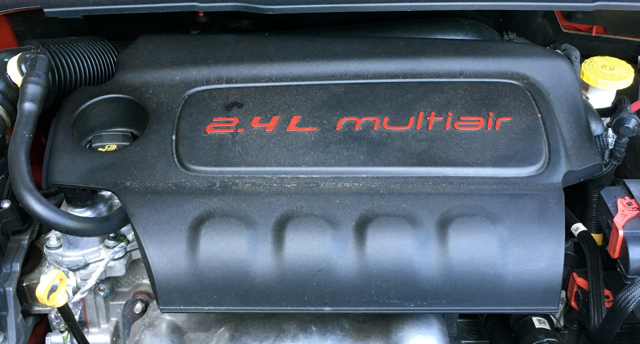 Here, you’d have 271 horsepower to work with — solid power for a small SUV. Another option would be to utilize the 3.0-liter turbo-diesel in the Grand Cherokee, making 240 horsepower with an output of 420 pound-feet of torque. Either choice would be great…the new Compass simply needs another option. As for the transmission choices, a 6-speed manual gearbox is the base choice with both the front- and all-wheel drive models. Choose an automatic and you’ll find a 6-speed on FWD Compasses and a 9-speed on AWD models. My test model had the 9-speed and it has improved greatly since it rolled out a few years ago. This ZF-supplied transmission shifted seamlessly in the background, unlike the gear-hunting experienced when it was introduced in the current-generation Cherokee. Engage “4WD Lock” and the transmission starts off in second gear when activated. Again, this isn’t true four-wheel drive…it just mimics it. If you’re planning any sort of off-road adventure, the Trailhawk edition with its 0.5-inch raised ground clearance, real skid plates, and tow hooks is the model you’ll want. So, now you have a new Compass to consider. Along with the Renegade, Cherokee, and Grand Cherokee, that’s four modern Jeep crossover utility vehicles to weigh. If you insist on rugged off-road durability, there’s also the Wrangler and Wrangler Unlimited. Many choices and that means there is something for nearly everyone. Wait a few years and the upper end of the segment will gain the Wagoneer and Grand Wagoneer. A Jeep pickup truck is also on the way. It just doesn’t get better than this. 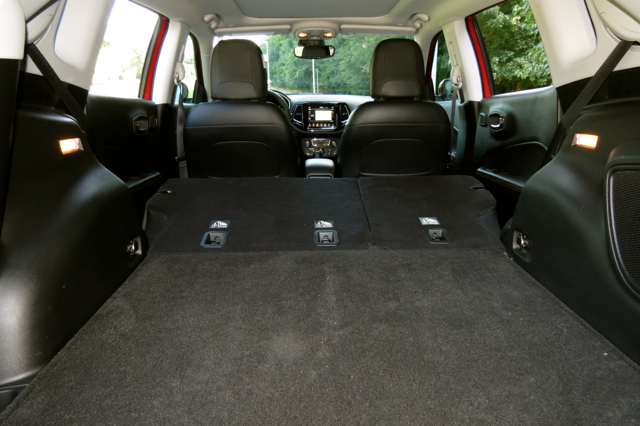 The Compass’ competitive set is as wide as it is deep, comprised of the following models: Ford Escape, Toyota RAV4, Chevrolet Equinox, Nissan Rogue, Hyundai Tuscon, Honda CR-V, Volkswagen Tiguan, Mitsubishi Outlander, Mazda CX-5, Kia Sportage, and the Subaru Crosstrek. If you decide the Compass is for you, start your search with the Latitude, what brings in automatic headlamps, cornering fog lights, power adjustable and heated side mirrors, roof rails, 17-inch wheels, and tinted glass. You’ll also have ambient lighting, illuminated mirrors, leather touches on the steering wheel and shift knob, and keyless entry. 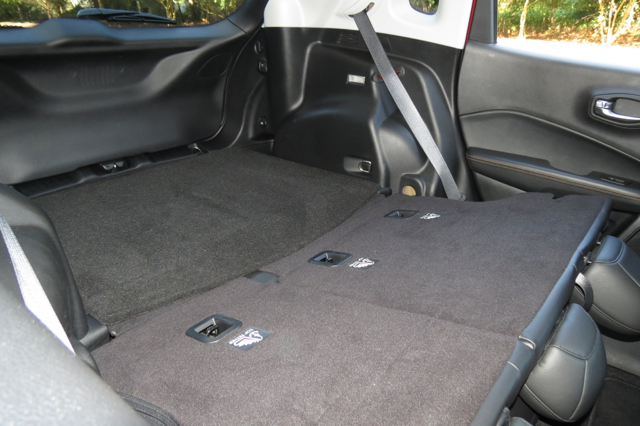 Add navigation and the popular equipment group package, and you’ll have a well-equipped FWD Compass for about $25,000. New Compass photos copyright Auto Trends Magazine. All rights reserved.